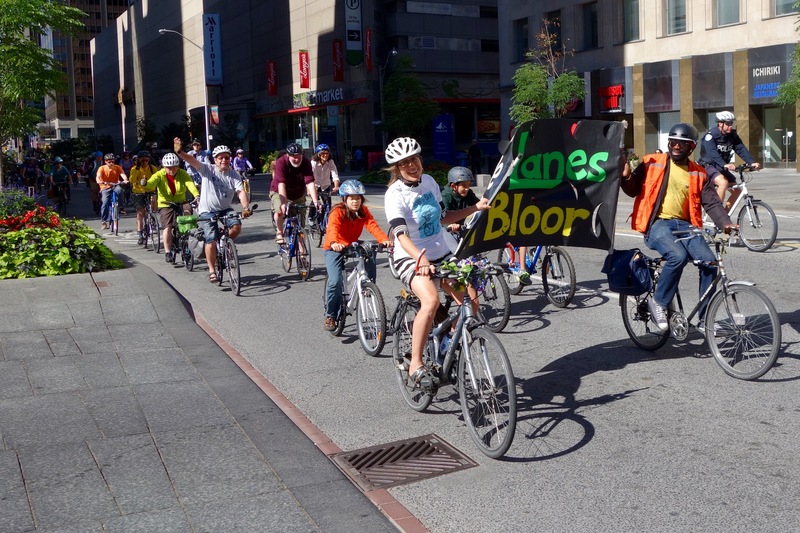 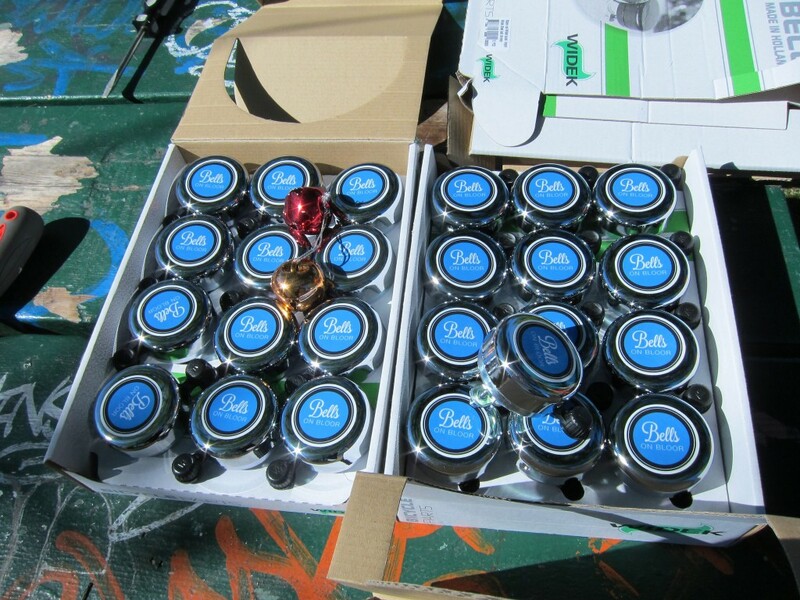 Bells were handed out for the "victory lap" of the new Bloor bike lanes on Sunday at the Suzuki Crawlfest. 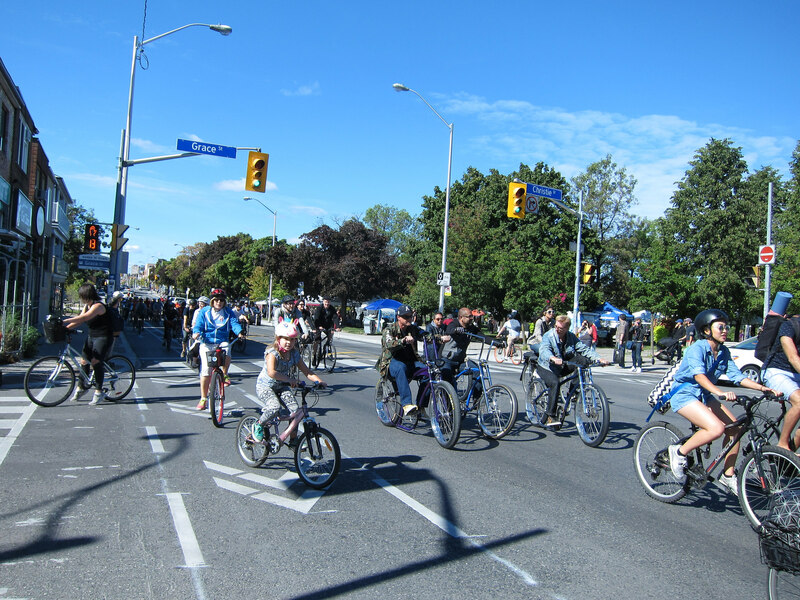 On Sunday, September 25, 2016, a few hundred cyclists and some super friendly police officers gathered at Christie Pits at 11 a.m. for a "victory lap" of the new bike lanes on Bloor, organized by Bells on Bloor. 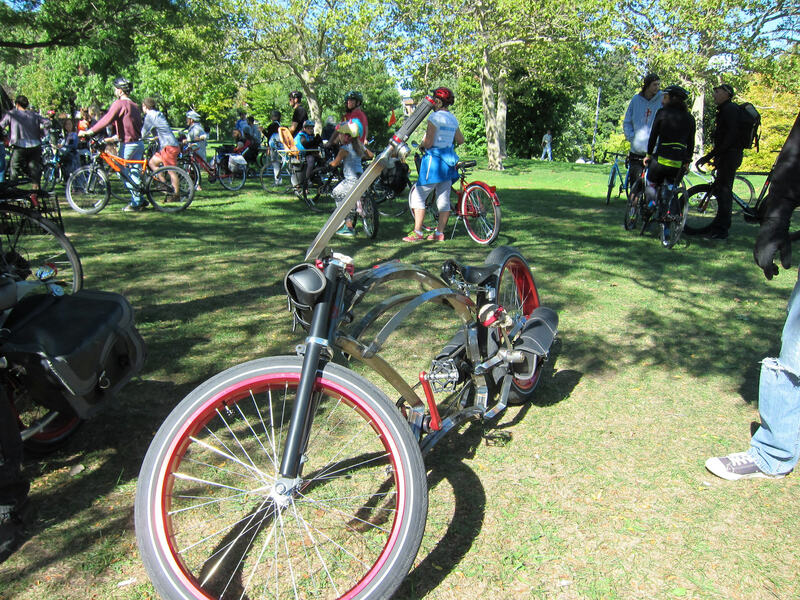 Later in the day we gave away a beautiful Public brand bike featured in our Bee Scene fashion shoot from the current issue, courtesy of Cycle Couture. 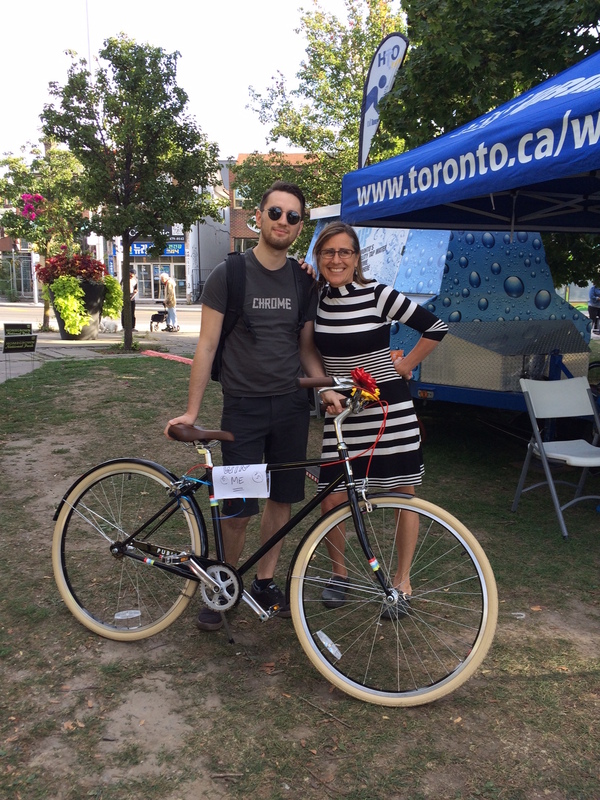 Cycle Couture owner Serge with bike winner Angela. 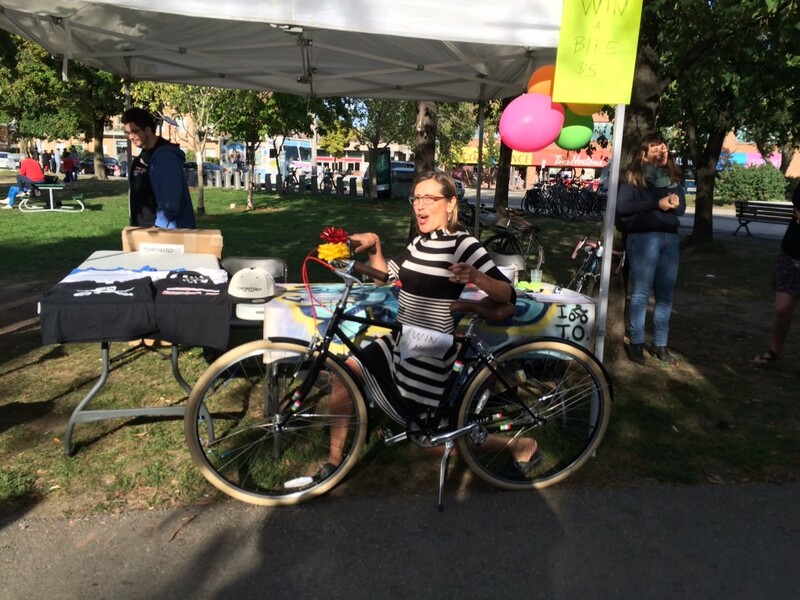 The lucky winner - bike lane advocate OG Angela Bischoff - rejoices! Congrats Angela, and thanks to everyone who stopped by to say hi at the dandy and Torontoist booth. 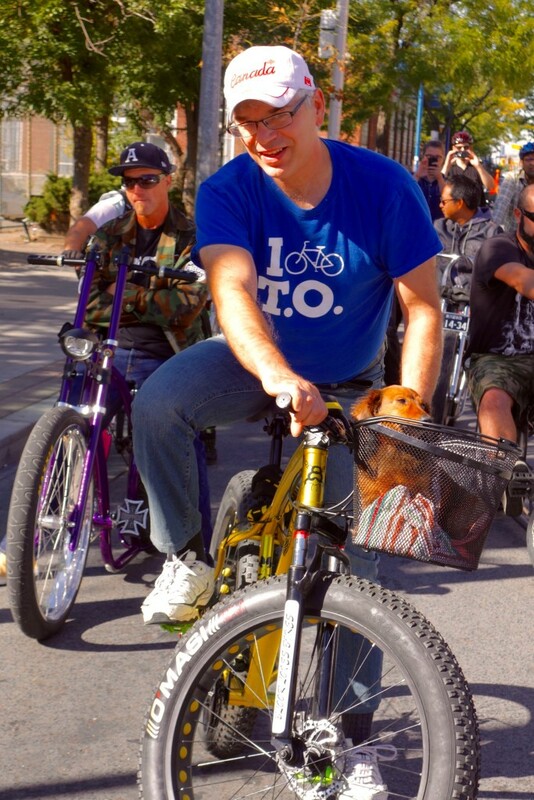 David Hains, Torontoist EIC, and Cayley James, dandyhorse associate editor above. 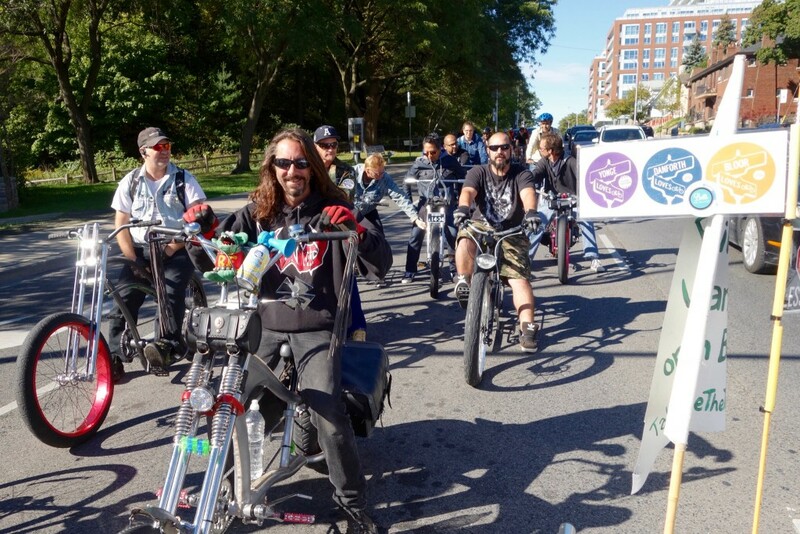 Check out more fab photos from this great event below. 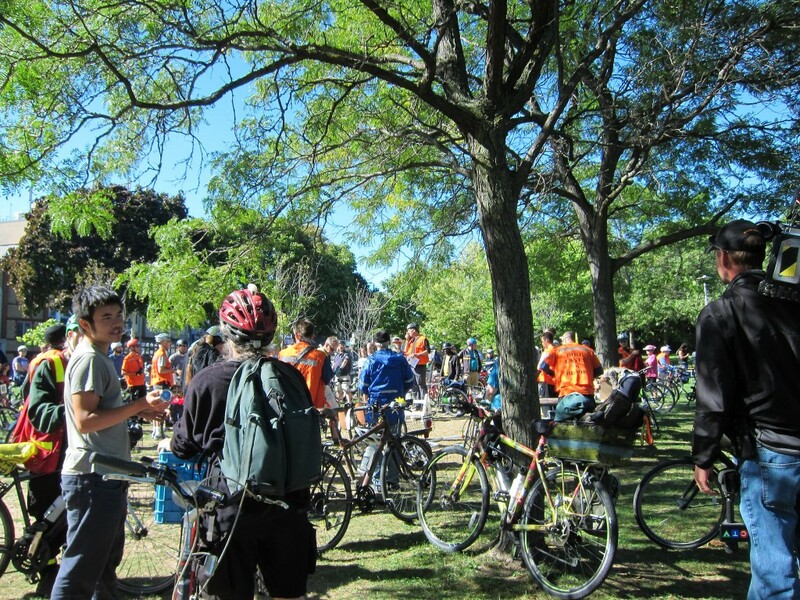 Angela and Adrian flying the banner as the massive group ride sets off from Christie Pits park. 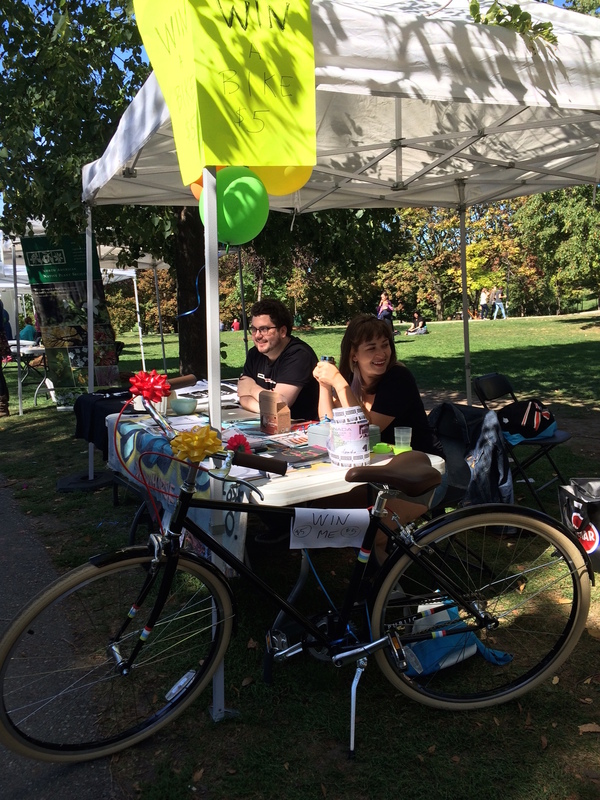 Angela is riding the bike of her late partner, Tooker Gomberg. Tooker was one of the first advocates to push for bike lanes on Bloor. Bike-friendly City Councillors Cressy and Layton speaking to the media. 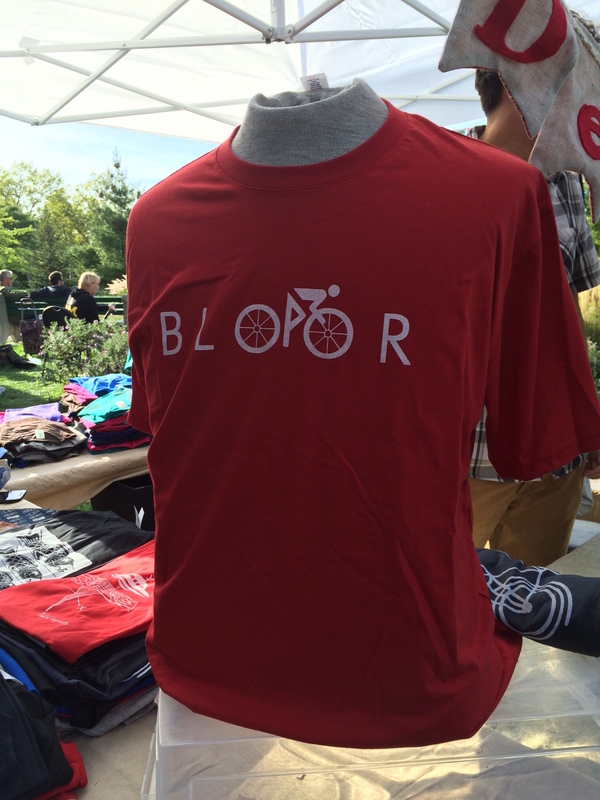 One clever vendor made swift business with these Bloor bike shirts which, um, borrow the BikeStock design. 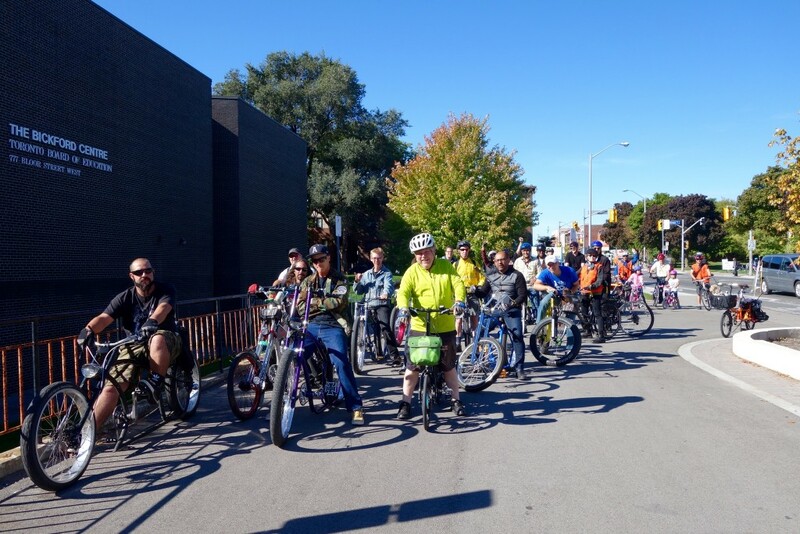 Great to see so many different bike types show up. These low-riders joined Jun Nogami's group to ride in from the west end (with more photos directly below by Jun.) 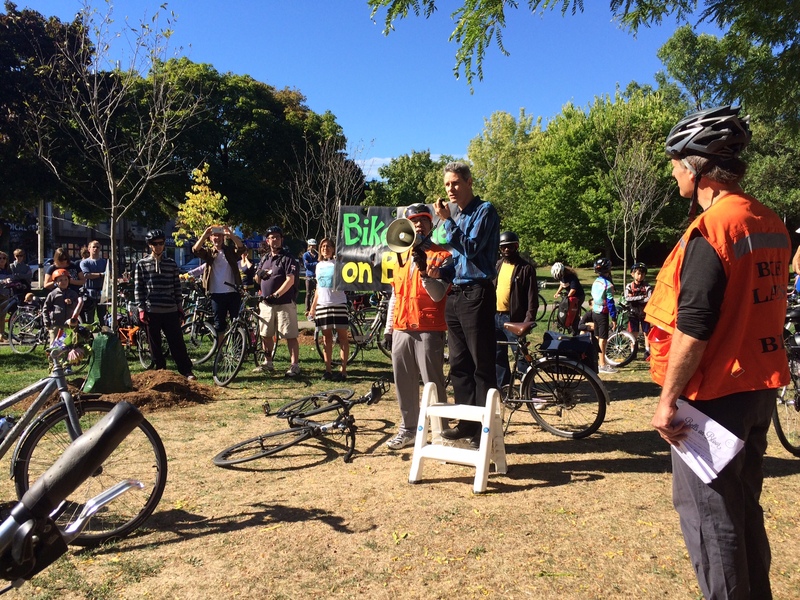 You can read Jun's report here. 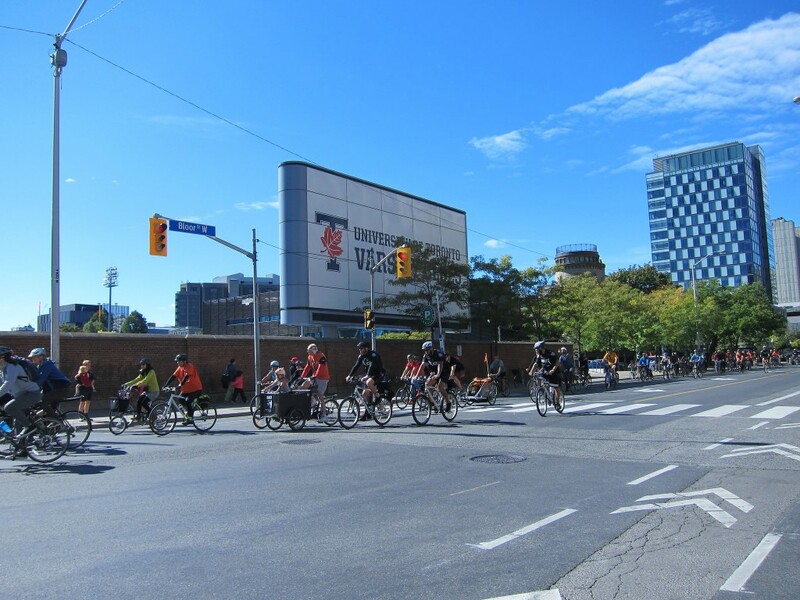 A similar group ride came in from Scarborough in the east. 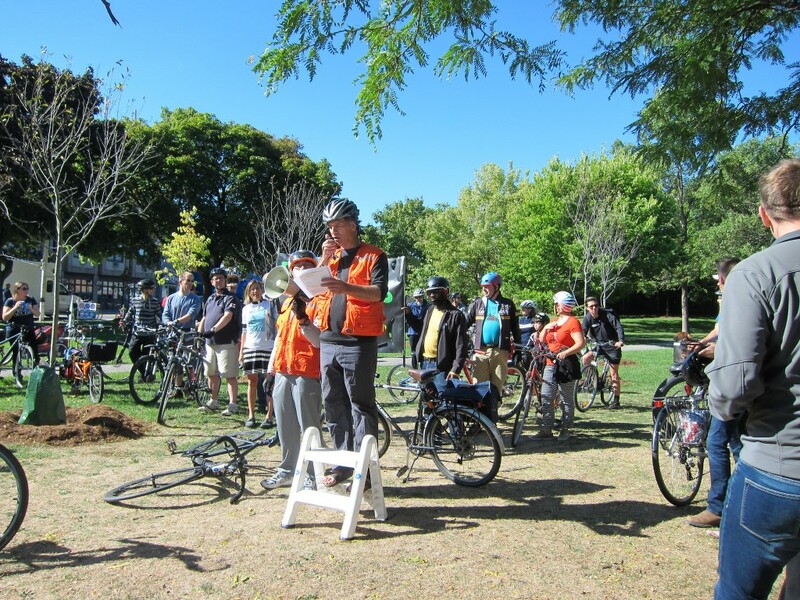 Read TCAT's Marvin Macaraig's story about the ride here. 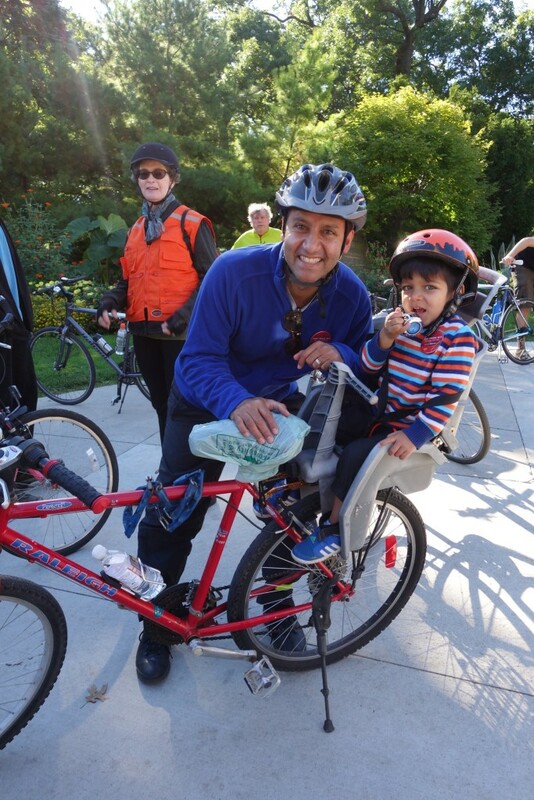 Good to see High Park MP Arif Virani supporting cyclists and joining in for the west-end ride. 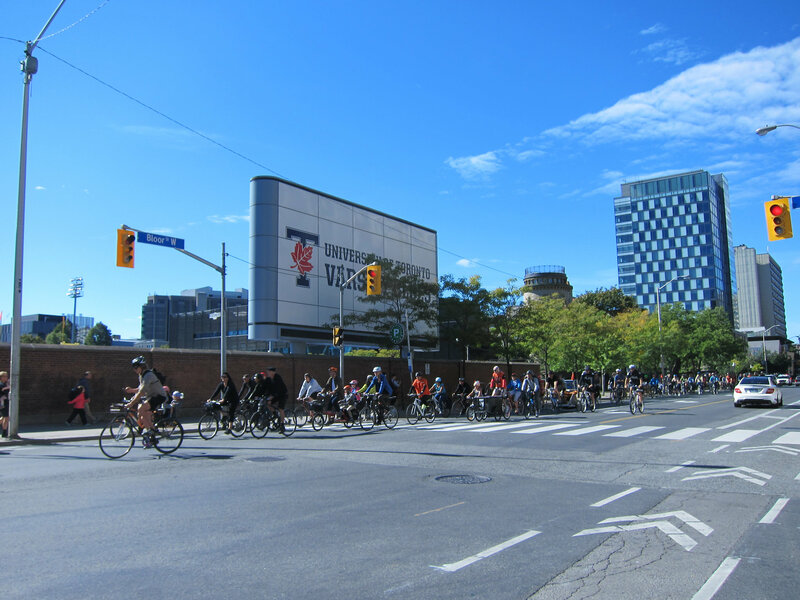 Stopped at Keele (above). 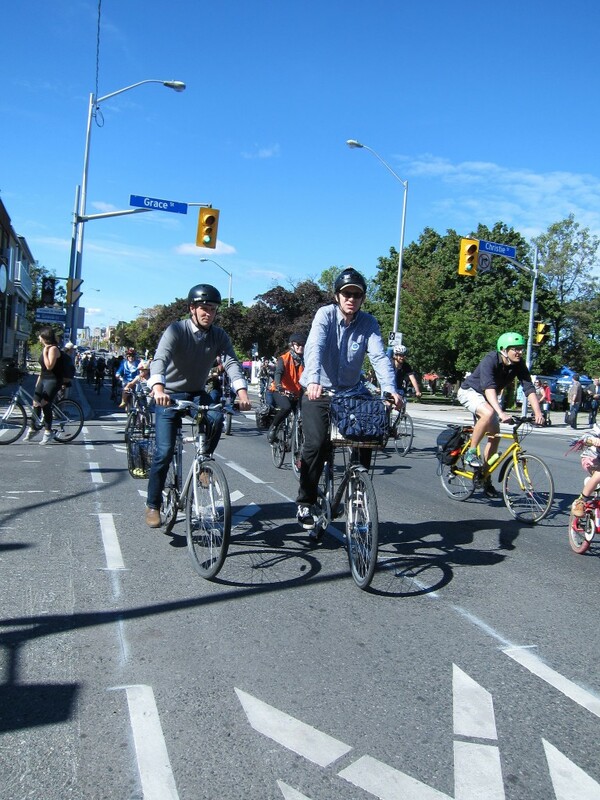 Says Jun: "For some reason, when you are riding with these guys, you get more respect from motorists!" 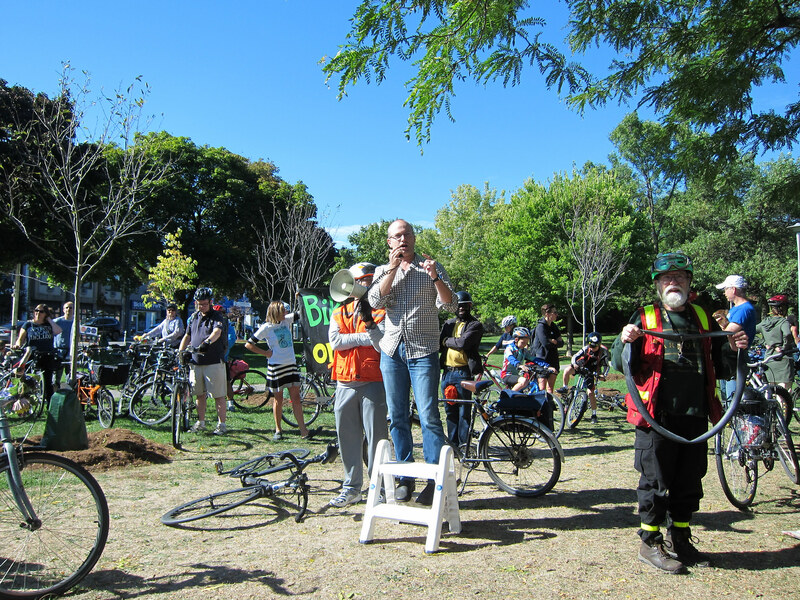 More photos by Tammy Thorne following from this great event. 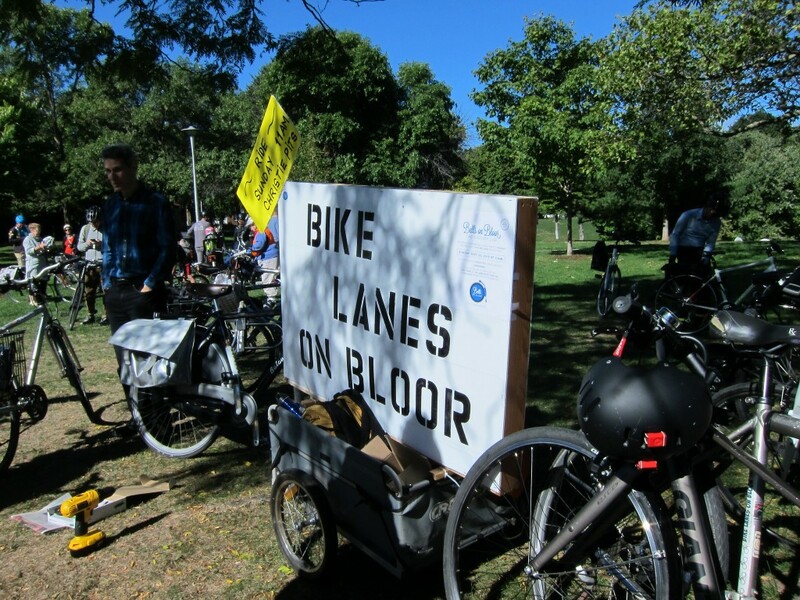 Albert Koehl, MC and Bells on Bloor founder gives thanks to all involved in this bike lane install, and introduces speakers, including Jared Kolb from Cycle Toronto, an organization which is now helping to push for bike lanes on the Danforth too. 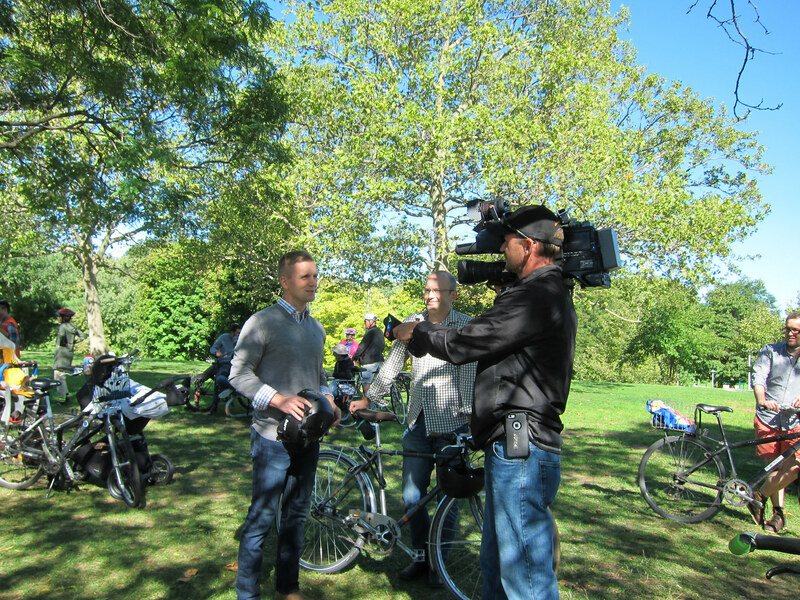 Councillor Joe Cressy rides on, while chatting with sax man Richard Underhill. 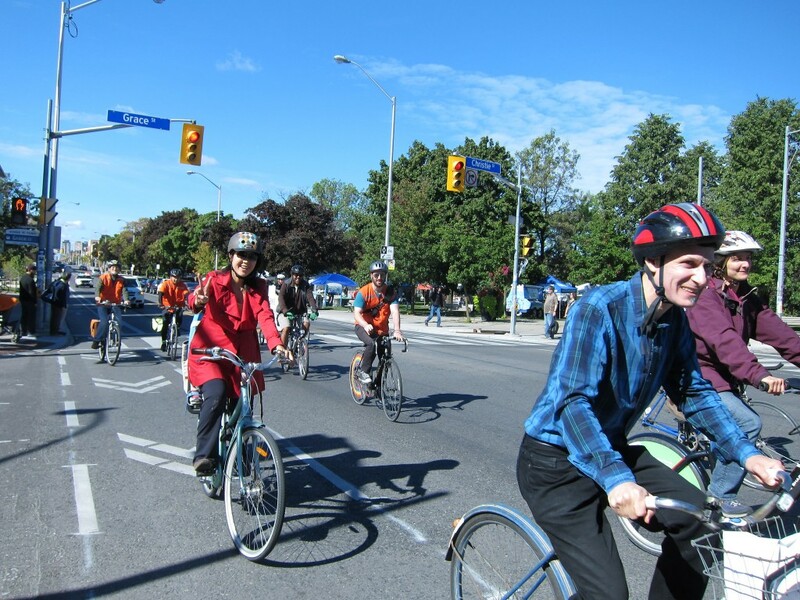 Gideon Forman of the Suzuki foundation above (right) is having a blast riding with friends in the new bike lane. 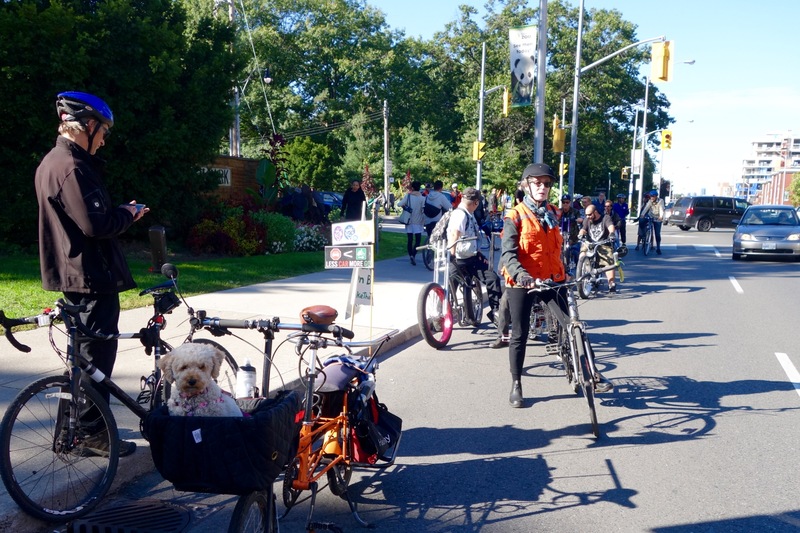 Hundreds showed up for the "victory lap" group ride of the new two-and-a-half kilometre bike lane on Bloor, even though there were many other events on this beautiful sunny Sunday afternoon. 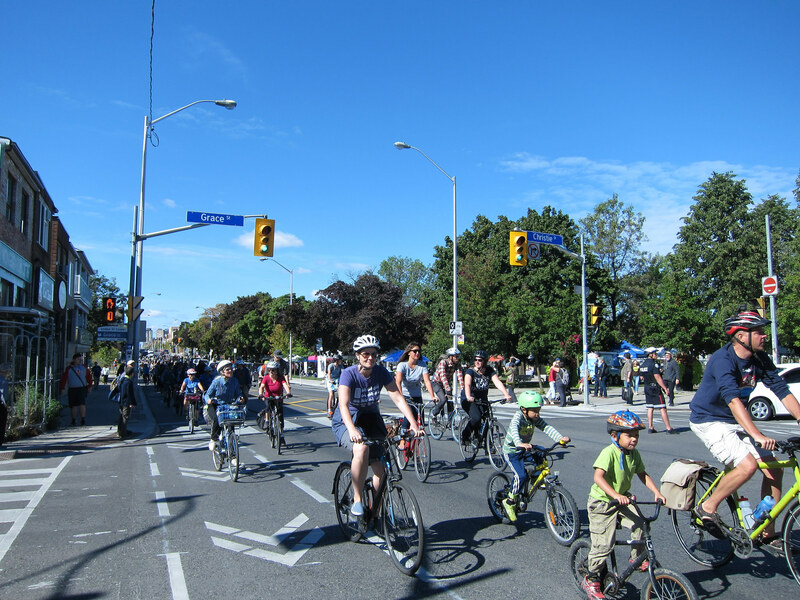 Big thanks to the Suzuki Foundation for supporting bike lanes and forever thank you to all the cycling advocates who work so hard for these small but meaningful victories. 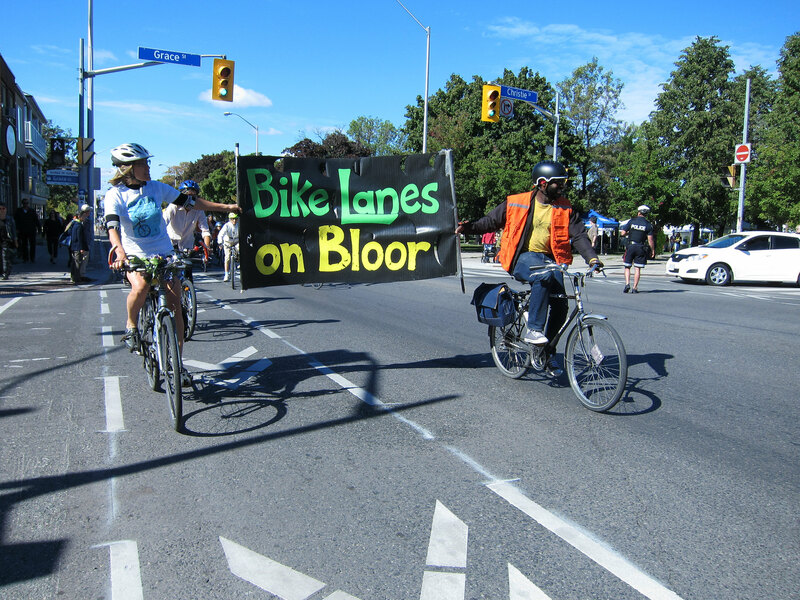 Bike Spotting on Bloor: What do you think of the new bike lane?